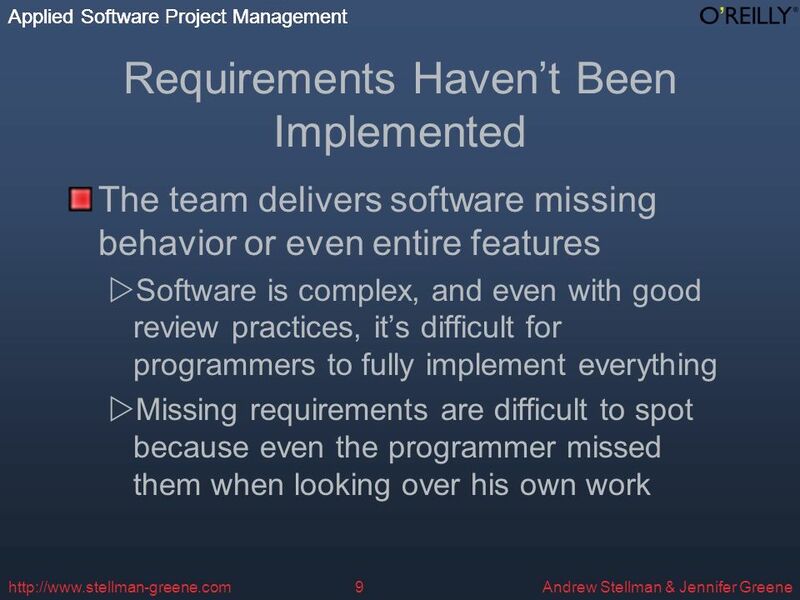 Applied Software Project Management Andrew Stellman & Jennifer Greene Applied Software Project Management Why Software. 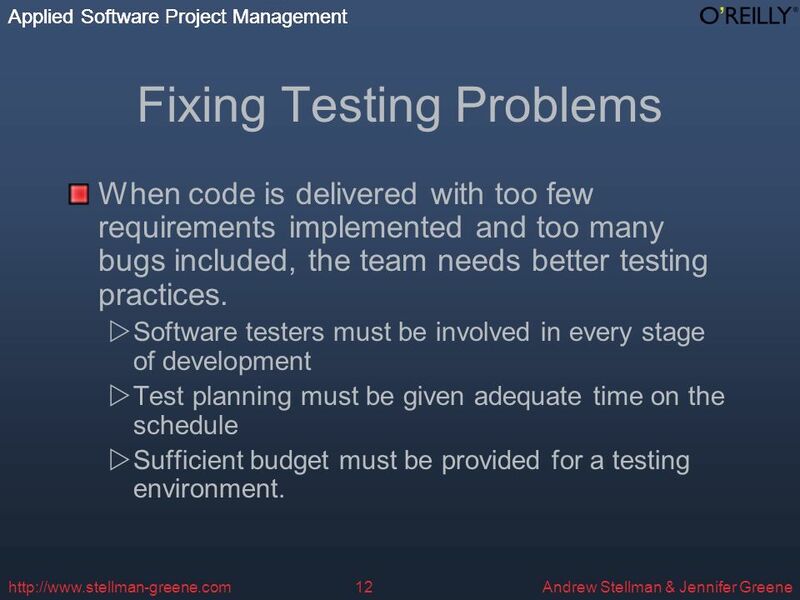 12 Applied Software Project Management Andrew Stellman & Jennifer Greene Applied Software Project Management http://www.stellman-greene.com12 Fixing Testing Problems When code is delivered with too few requirements implemented and too many bugs included, the team needs better testing practices. 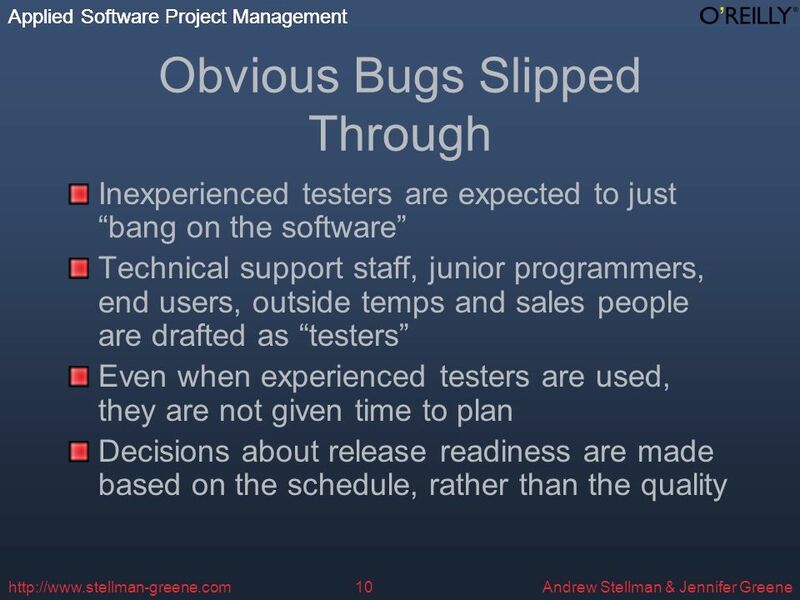 Software testers must be involved in every stage of development Test planning must be given adequate time on the schedule Sufficient budget must be provided for a testing environment. 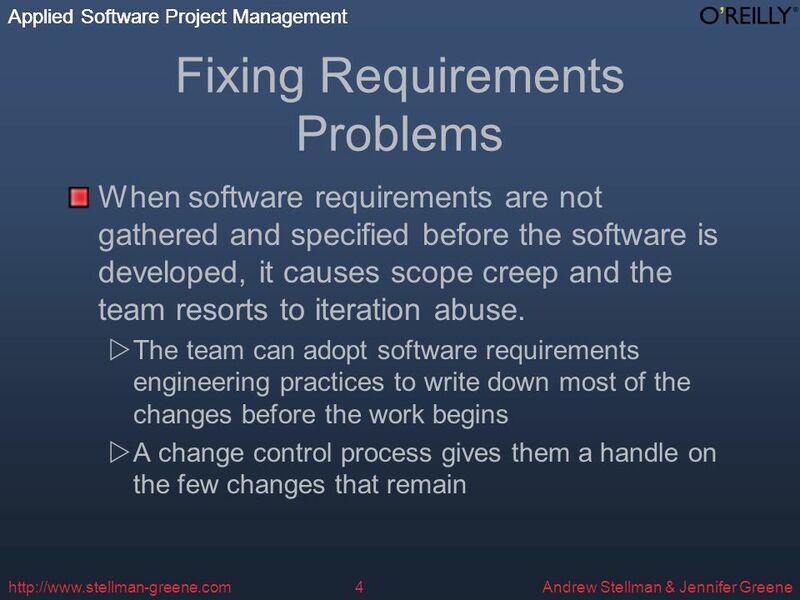 13 Applied Software Project Management Andrew Stellman & Jennifer Greene Applied Software Project Management http://www.stellman-greene.com13 Common Problems Can Be Avoided! 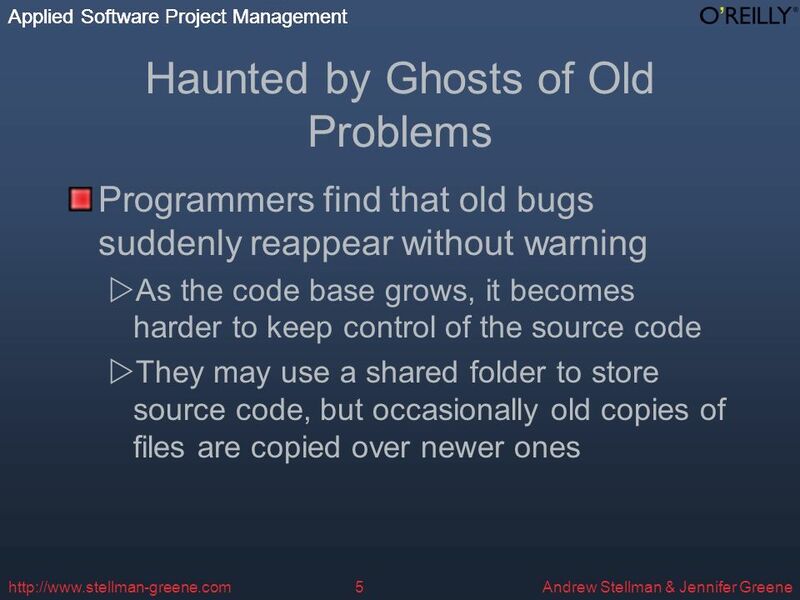 Almost everyone has experienced at least a few of these problems. We know what causes them, and we have tools, techniques and practices that can fix them. 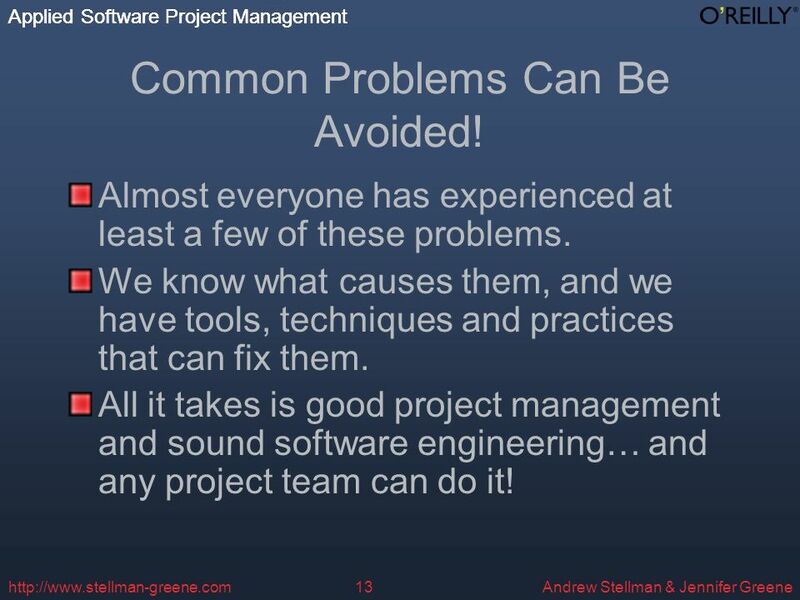 All it takes is good project management and sound software engineering… and any project team can do it! 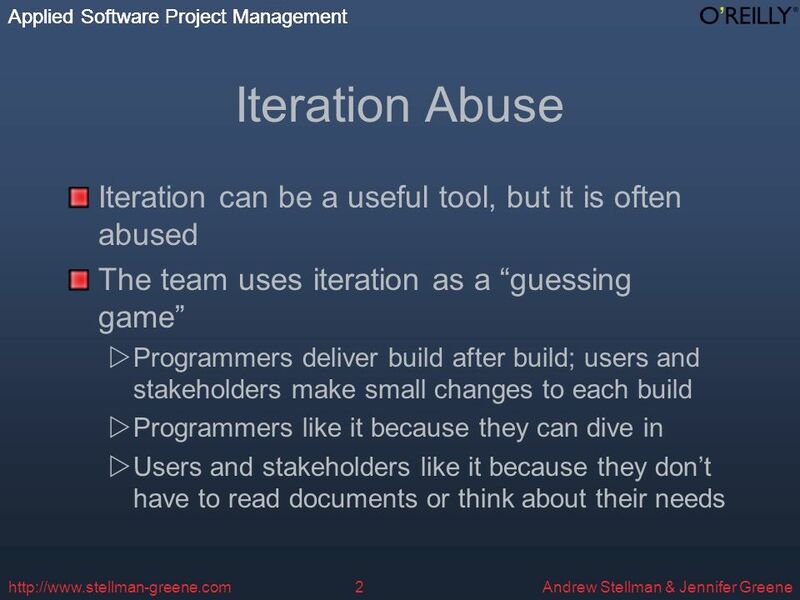 Download ppt "Applied Software Project Management Andrew Stellman & Jennifer Greene Applied Software Project Management Why Software." October 2002www.qimpro.com1 SIX SIGMA BLACK BELT Summary of Steps. 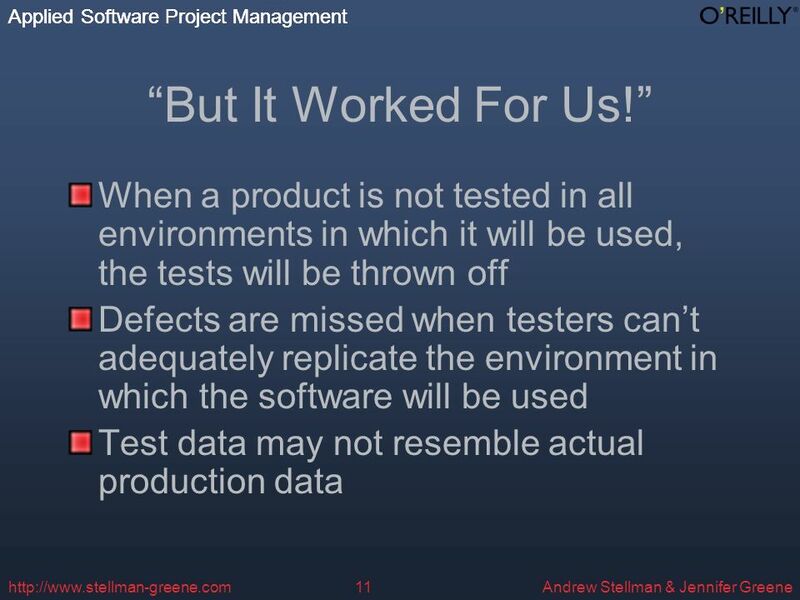 Why Use Test Driven Development (TDD)?. 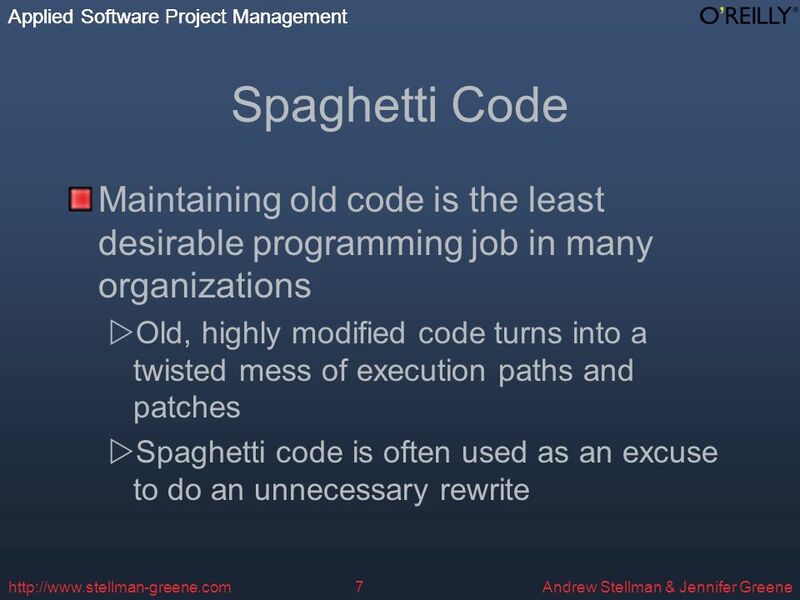  Why the need to change to TDD. 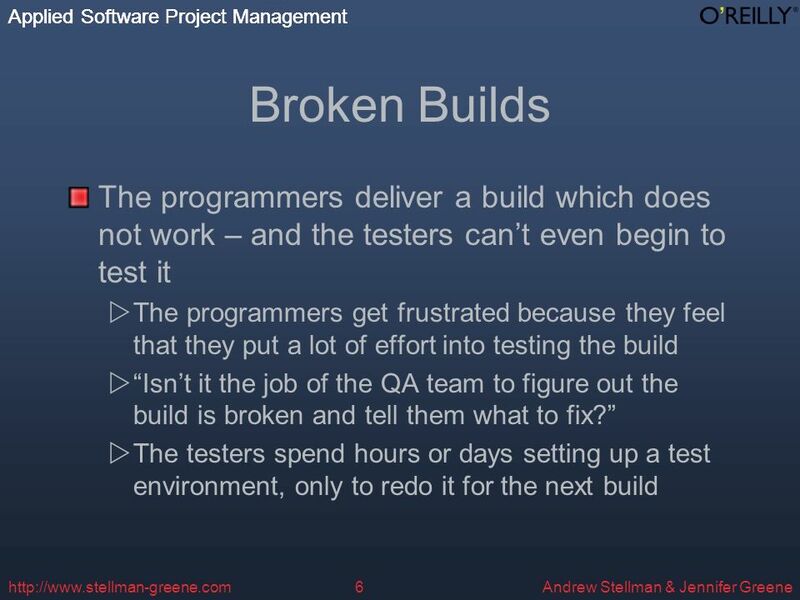  Talk about what TDD is.  Talk about the expectations of TDD. 1 Design and Integration: Part 1. 2 What’s a metaphor? Ward Cunningham cites George Lakoff’s book, Metaphors We Live By: Lakoff argues that the assumptions. 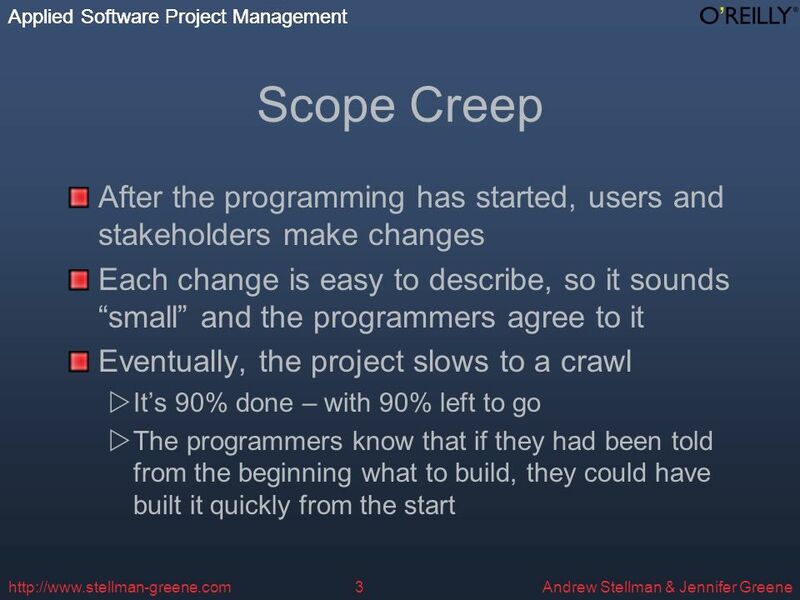 Applied Software Project Management Andrew Stellman & Jennifer Greenehttp:// Applied Software Project Management Introduction. 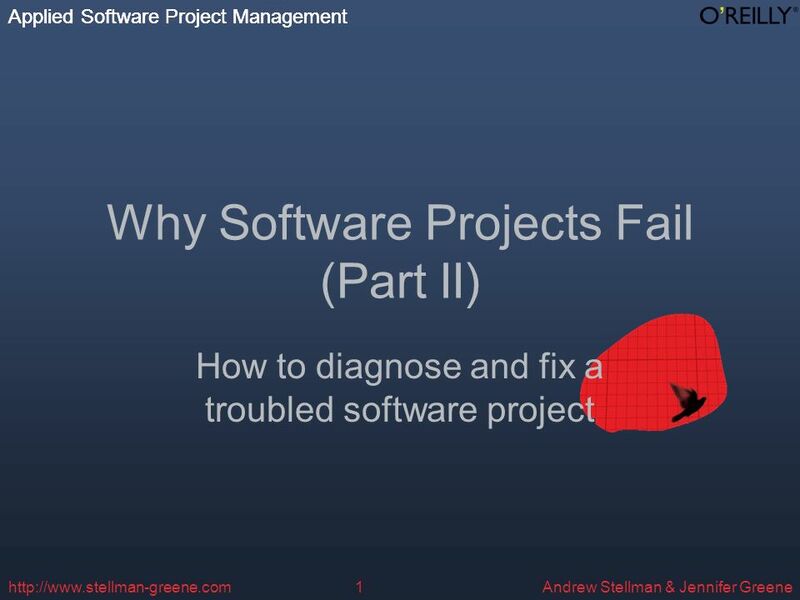 Applied Software Project Management INTRODUCTION Applied Software Project Management 1 5/20/2015. Agile Requirements Methods CSSE 371 Software Requirements and Specification Mark Ardis, Rose-Hulman Institute October 26, 2004.
Review: Agile Software Testing in Large-Scale Project Talha Majeed COMP 587 Spring 2011. EXtreme.NET Dr. Neil Roodyn. eXtreme.NET Who is Dr. Neil? 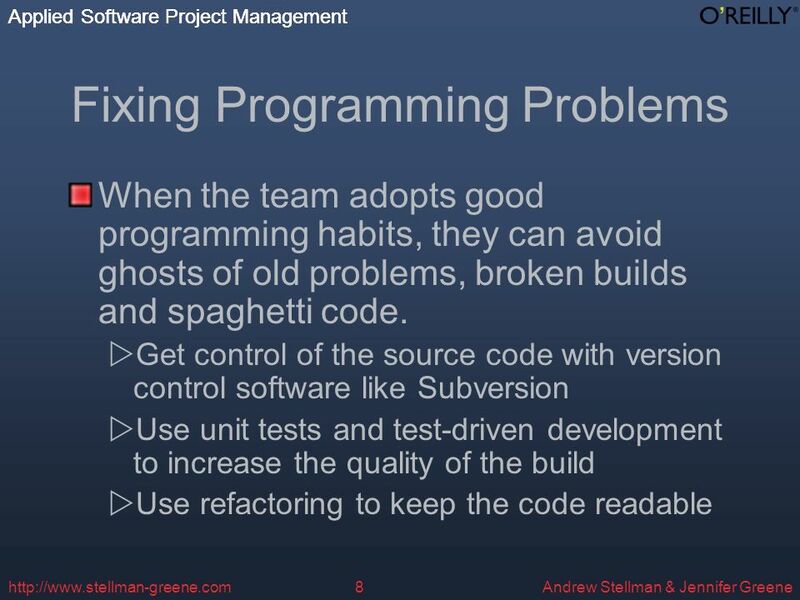 MISSION: To increase the value of your Software Business Working with software for way too long. March 30, Exploratory Testing Testing Approaches Analytical Information-driven Intuitive Exploratory Design the tests and test concurrently Learn.